July 1, 2009 -- Animal societies are hotbeds of conflict and cooperation, with creatures helping each other one moment and fighting the next. Biologist Andrew Zink has developed a new theoretical framework that helps explain why these societies stay together and remain peaceful in the face of conflict over resources. In the animal world, individuals often raise their young together, sometimes in despotic communities where a few adults hold exclusive rights to mating, while others have to forego or delay breeding in order to escape aggression or eviction. 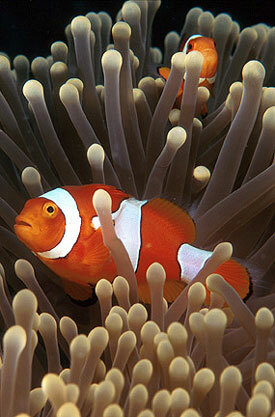 One such animal is the bright orange, striped clownfish that live among the tentacles of sea anemones. Although named for its "clowning around" behavior, clownfish can be extremely aggressive. Zink and his collaborator Peter Buston tested their theory of animal conflict on the clownfish communities, which typically have one breeding couple and four other fish, which are not allowed to mate. The researchers used the model to make predictions about the group's dynamics and why they remain tranquil. Consistent with what they would expect to find, the researchers found that the "non-breeders" put up with the group's unfair conditions because they have little chance of survival outside the anemone, which provides them with food and protection. "In the natural world, we often see societies that seem unfair in human terms, with one animal dominating the resources in the group," said Zink, assistant professor of biology. "This begs the question of why the subordinate members stay in the group and endure this inequity." Until now, biologists have used a patchwork of different models to explain what holds these societies together. Zink and Buston have combined multiple models to form a single universal theory of reproductive conflict that can be applied to animals as diverse as meerkats, paper wasps and clownfish. Unique to this complex model is the fact that it simultaneously addresses how animals bargain based on their options for leaving the group and their options for fighting within the group. It builds on the work of evolutionary biologist William Hamilton whose kin selection theory explained why some animals altruistically give up their own reproduction to help raise their relative's offspring. Zink and Buston's theory has real world applications in the areas of conservation, habitat restoration, zoos and national parks. "Understanding the ultimate causes of social behavior can help inform ways to keep social animals happy and healthy in captivity," Zink said. "The theory can tell you what conflicts you can expect and how changes in food, family structure and environment will affect group dynamics." Zink and Buston, a post-doctoral fellow at the Spanish National Research Council, outlined their theory in a cover article for the May/June issue of Behavioral Ecology.